Claude Lelouch, Jean-Luc Godard, and François Truffaut | Based on truth (and lies). 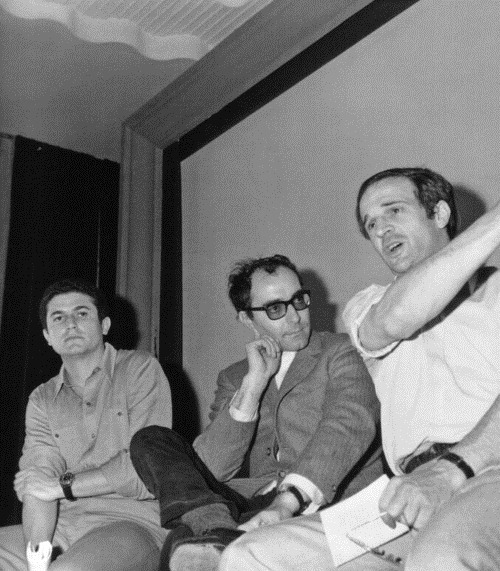 Claude Lelouch, Jean-Luc Godard, and François Truffaut call for a halt to the 1968 Cannes Film Festival due to the ongoing nationwide strike in France. Why did you stop the Cannes Festival? Because it was the logical thing to do. France was closing down, therefore Cannes had to close down. While I was driving to Cannes on May 17 to take part in a press conference about the Cinémathèque affair, I was listening to the radio and every half-hour came reports of more factories being occupied. I wasn’t sorry to see France paralyzed, the government was in disarray. Next day, when I asked for the Festival to be stopped, I wasn’t thinking particularly of a gesture of solidarity with the workers—I’d have been more likely to feel solidarity with the four students who were sentenced to jail after a hasty session in a Sunday court. I wasn’t really thinking of challenging or reforming the Festival, of doing away with evening dress or making it more cultural. No, I just felt that in its own interest the Festival should stop of its own accord rather than be halted a few days later by the force of events. I didn’t see it as a military coup, I simply wanted an unambiguous situation. In fact, this is how it happened. Anyway, we had to get the Festival stopped and we did. It could maybe have been managed more elegantly, but in circumstances like this you’re inclined to check your manners with your hat—and someone probably throws away the cloakroom key. I know that a lot of people will hold our attitude at Cannes against us for a long time to come, but I also know that a few days later, when there were no more planes and no more trains, when the telephones weren’t working and we’d run out of petrol and cigarettes, the Festival would have looked utterly ridiculous if it had tried to carry on. Sight and Sound, Autumn 1968. This entry was posted in Je fais du cinema and tagged and François Truffaut, Cannes 1968, Claude Lelouch, jean-luc godard. Bookmark the permalink.